There are many ways to say Thank You in Japanese just like many other languages. In English, they say Thanks, Thank you so much, I appreciate it, etc. Likewise, the ways to thank people in Japanese can be different depending on the situation or people you are thanking. Here are what we will discuss in this blog. I am sure many of you know ありがとう Arigato and ありがとうございます Arigato gozaimasu. Both expressions mean Thank you in Japanese, but do you know the difference between those two? The difference is the speech style. ありがとう Arigato is the Informal version of Thank you, and we use it to only those people with who we do not need to be formal. They can be your family members, close friends in the same age group or young children. On the other hand, ありがとうございます Arigato gozaimasu is the Formal version of Thank you. As a grown-up, you will have to use this one most of the time except when you are talking to someone very close to you. So, when you visit Japan and interact with people unless they are already close friends to you, you will have to use ありがとうございます Arigato gozaimasu during your trip. Try to stick to ありがとうございます Arigato gozaimasu when you thank people in Japan, such as a salesperson at a shop, a front desk clerk at a hotel, or random people who helped you. It makes you sound modest, polite and mature. Modest and polite people are very well received in Japan. The phrase ありがとうございます Arigato gozaimasu literally means it is difficult to exist. It refers to someone’s action or deed that is difficult to exist, hence rare and precious, and something that we should be thankful. Now, have you heard of ありがとうございました Arigato gozaimashita? This also means thank you in Japanese, but how is it different from ありがとうございます Arigato gozaimasu that we just discussed? Because of this, ありがとうございました Arigato gozaimashita means more like “Thank you for what you have done for me” or “Thank you for having helped me.” It is usually said to people AFTER they did something nice for you. For instance, when someone helped you with moving, at the end of the day you should say ありがとうございました Arigato gozaimashita and not ありがとうございます Arigato gozaimasu for his help with moving. But when someone says Happy Birthday or Congratulations on your engagement, you can simply respond ありがとうございます Arigato gozaimasu because the person didn’t do anything particular to help you out. I hope now you know the difference between ありがとうございます Arigato gozaimasu and ありがとうございました Arigato gozaimashita. 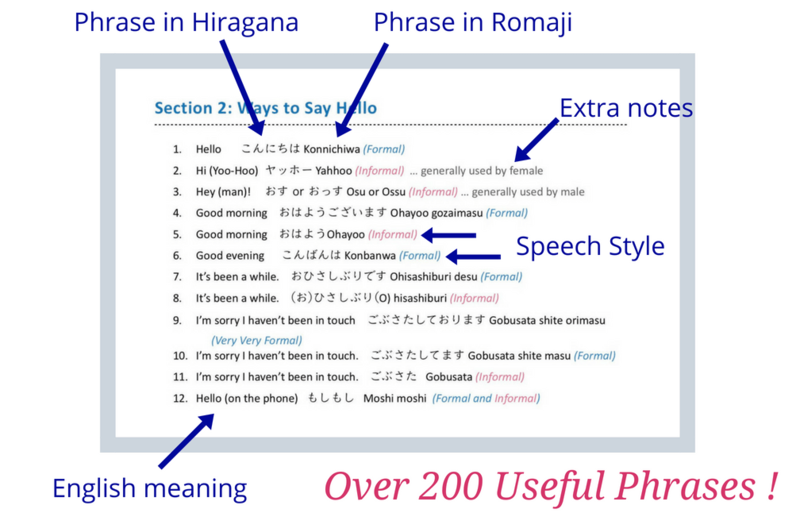 Here is another way to thank people in Japanese. Do you know that you can also use すみません Sumimasen to say Thank you? すみません Sumimasen usually means I’m sorry or Excuse me. But you can use it to express your gratitude in the sense that I’m sorry that you had to go through this much trouble for me but thank you so much. It means that kind of thank you. Therefore, when somebody visits your house with a nice gift, you can say すみません Sumimasen meaning Thank you, or すみません Sumimasen and ありがとうございます Arigato gozaimasu together in one sequence. By saying すみません in this situation, it adds the connotation that you do acknowledge the trouble the person had to go through to find the gift for you and because of that, you are even more grateful for his or her kindness. 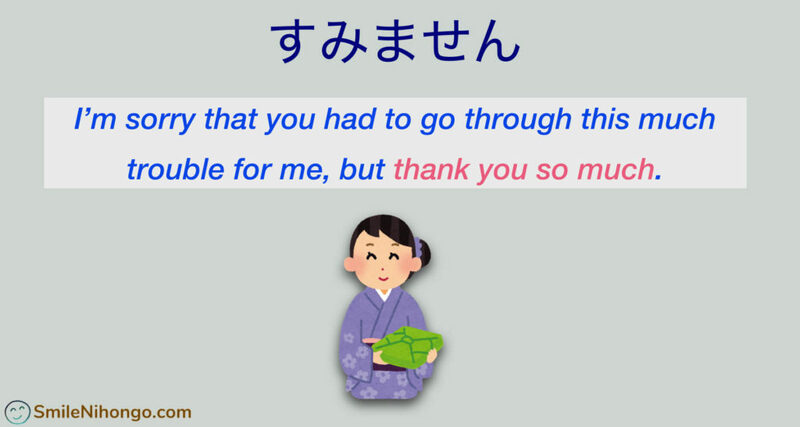 One last Thank You in Japanese is the expression that we specifically use to thank a meal or food. There are two Thankyous for before and after eating. The first one is what we say before eating, which is いただきます Itadakimasu. いただきます Itadakimasu literally means “I humbly accept” and many Japanese people put their hands together and slightly bow as we say this phrase. If it’s after eating, then we say ごちそうさまでした Gochisosama deshita. ごちそうさまでした Gochisosama deshita literally means “this was a feast.” Again, people often put their hands together and slightly bow as they say ごちそうさまでした Gochisosama deshita. This is the best way to say Thank you to someone who cooked for you or treated you to a nice dinner. Also, when you visit Japan and eat at a restaurant, it is a very nice gesture to say ごちそうさまでした Gochisosama deshita to the waitress or the restaurant owner as you leave the restaurant. It will make them very happy to know that you enjoyed their food. 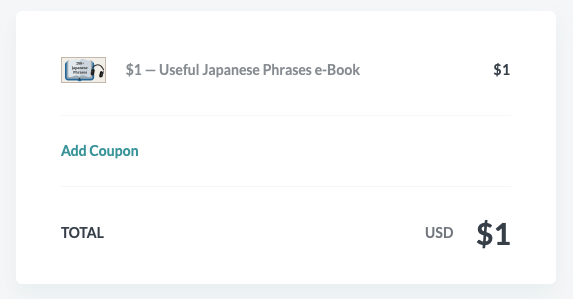 So now you know various ways to say Thank You in Japanese. I hope this article helped you to understand the proper ways to say Thank You in Japanese for different situations. 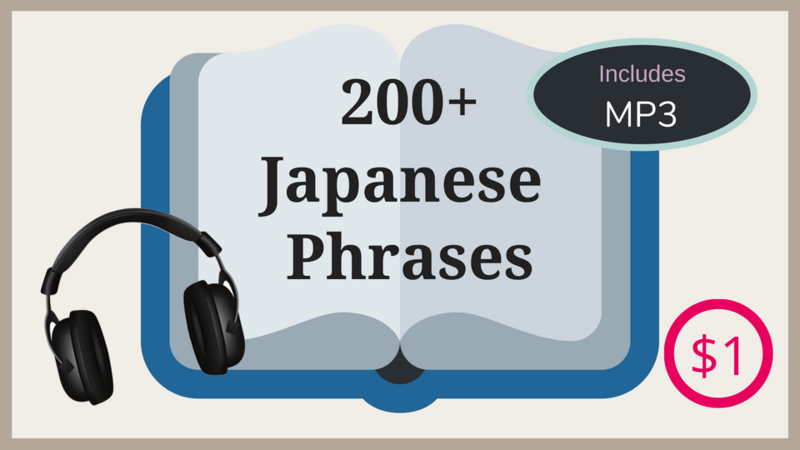 You can learn over 200 Japanese phrases in my eBook ($1 only). 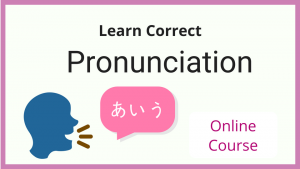 It comes with MP3 audio files that you can download so you can practice your listening comprehension or pronunciation of phrases. Here is a sample MP3 of the phrases #1 to #12 shown above. Each phrase is specified if it’s Formal or Informal speech, and also mainly used by male or female. You can make a payment either with a credit card or PayPal account. It’s only $1 for over 200 Japanese phrases. Click below to get the eBook!